Why we settle cases…and I need a new associate. Discussion of the Wisconsin Court of Appeals decision in Krause v. Krause. Two contempt cases: Krause v. Krause and Tauber v. Tauber. International Child Abduction Remedies Act (ICARA), Social Security Disability Insurance benefits and child support, Tribal court jurisdiction over child support, UCCJEA and Hague convention and more. 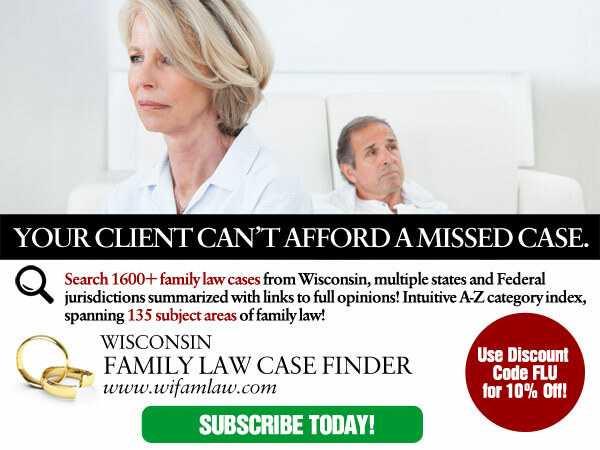 This month’s Wisconsin Courts Update includes (sob!) a case which I lost at trial and now on appeal. Listen to my monthly video message for my “take home” lessons on this case – done with a minimum (please note that I did not say “none”) of whining. 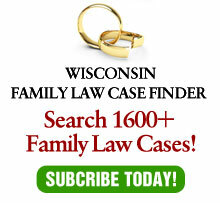 You may note that there isn’t a Family Law Online section this month. That is due to the fact that my associate, Kelley Shock, who did that part of FLU, has not only left my office, but left the practice of law (double sob!). So, I am looking for a new associate. If you know someone with 3 to 7 years of experience who may be interested, please have them contact me at (414) 272-5632 or via e-mail. Apparently the contempt was not continuing, according to the Wisconsin Court of Appeals decision in Krause v. Krause. Who knew? Editor’s Note:The following case is not recommended for publication, but may be cited for its persuasive value under Wis. Stat. 809.23(3). On July 17, 2018, the court of appeals issued its decision in Krause v. Krause (Appeal No. 2017AP1434). The appellate court affirmed the trial court for not finding the ex-husband in contempt for not providing tax returns contrary to court order. The trial court found that the ex-husband’s failure was not intentional and this finding was affirmed by the court of appeals as a reasonable exercise of its discretion. I represented the ex-wife. This is one of the most absurd decisions in my 30+ years of practicing law. Not intentional? What? He forgot? The following case is not recommended for publication, but may be cited for its persuasive value under Wis. Stat. 809.23(3). On July 31, 2018, the court of appeals issued its decision in Tauber v. Tauber (Appeal No. 2017AP1731). Wayne Tauber was held in contempt for violating the court’s order regarding his role in the funeral for the parties’ son who committed suicide. Despite the express order of the court that the mother, Shelly, was responsible for all necessary funeral arrangements, Wayne set up a table in the viewing area of the casket with suicide prevention information and cards which included text telling “Parents listen to your child”, which seemed to be a criticism of Shelly. Wayne also attempt to hold Hmong services, again in direct violation of the court’s order. He was found in contempt with purge conditions which included a six-month jail sentence which was stayed. The appellate court affirmed the contempt finding, but vacated the jail sentence as not being a proper remedial sanction. By the time of the court proceeding, his contempt was no longer continuing, but had already been remedied. Therefore the jail sanction was punitive and not remedial.